HI Vancouver Downtown i Vancouver, Kanada : Boka nu! Come and visit us at HI Vancouver Downtown. We are looking forward to having you as our guest! Free Breakfast! Join us in our dining room for a continental breakfast, which includes Muffins, Bagels, Toast, Cereal, Jam, Fruit and Juice. Enjoy complimentary coffee all day.! Free Wireless! Bring your laptop and enjoy free wireless. No laptop, no problem. We also have computer terminals available and for a small fee you can access the internet..
Prices quoted include Free Full Continental Breakfast Buffet every morning linen and towels, free wireless internet, and free coffee and tea all day. HI Vancouver Downtown is located in the safe and beautiful West End residential neighborhood, one block from colorful Davie St. with its many shops, restaurants and cafes. A two minute walk and you're at English Bay beach or False Creek Ferries to Granville Island. You can easily walk to Stanley Park or any downtown attraction and we also have bike rentals and easy transit access if you want to venture further. All dorms have only four beds and have lockers for your luggage, a sink and secure key-card access. Facilities include: pool table and foosball in our games room, library, TV room with cable, award winning tours and activities, kitchen, laundry, on-premises internet access (kiosks as well as free Wi-Fi), free onward booking for other HI-Canada hostels, comfortable mattresses, and all linen, bedding, towels and breakfast are provided free of charge. We even have free purified drinking water and free coffee and tea all day! Our friendly, experienced staff can help you plan your day and let you in on some Vancouver secrets! We hope to see you soon! Hostelling International is a Membership organization. 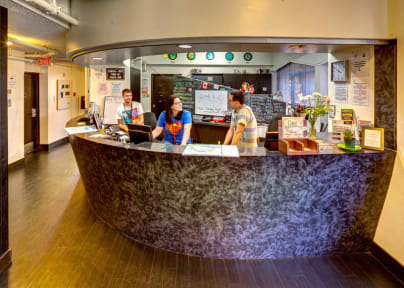 Your HI membership gets you tons of great discounts and a cheaper rate at HI hostels world-wide. HI Vancouver hostels do not accommodate residents of Vancouver or the Lower Mainland area of BC. Parking is limited, pay parking spots can be reserved directly with the hostel. We do not have rooms with ensuite facilities, but all rooms have sinks. HI Vancouver Downtown is part of HI Canada, a not-for-profit organization on a mission to build a community of conscious travellers who share a greater understanding of people, places and cultures.